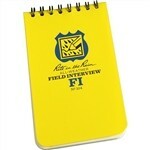 The Field Interview Note book is useful public safety notebook in a convenient size with printed format pages to effectively record information from field interview. Note book is top spiral bound ( 3" X 5" ) with 50 formatted pages on all weather rite in the rain paper. White Polydura plastic cover. Formated page has indicated spaces for Date, time, type of incident etc, names addresses, description categories for individuals and vehicles etc. Reverse of each page provided for free form notes.